Learn how to develop your rotational power so you can hit devastating forehands, backhands, and serves with Dominic King. Dominic will show you exercises that will translate to increased power on your strokes. 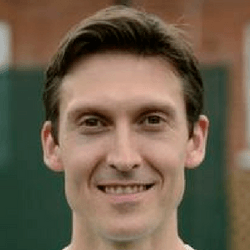 He is the Head of Athlete Development for Everyball Tennis at Halton Tennis Centre in the United Kingdom. Dominic is an iTPA Master Tennis Performance Specialist (MTPS), one of only a small number of people to hold this designation worldwide. Dom is also an Accredited Strength & Conditioning Coach (ASCC) with the UK Strength & Conditioning Association, and an NASM Performance Enhancement Specialist.